Slum areas are not just defined by the presence of poverty, they are also characterized by the near absence of public services. Residents of these areas often cannot access quality health and education services while infrastructure for water, sanitation and energy is usually woefully inadequate. This has impacts on the health and well-being of people who live in slums. APHRC research has shown that slum dwellers have similar if not worse health outcomes than rural poor populations. High rates of infant mortality and deaths from infectious diseases as well as diarrheal diseases reflect the hard reality of life in slums. This is striking because many slum residents are people who left rural areas for urban centers, seeking to improve their quality of life. In cases where public services such as clinics and hospitals within slums are provided, barriers to access still remain. Lack of financial resources can make it difficult for slum residents to utilize the few available facilities. Sometimes they simply cannot afford to take time off from work to seek the care they need. Poor political will on the part of municipal authorities may also result in the needs of slum residents being neglected. APHRC has partnered with the University of Warwick to study healthcare-seeking practices among people living in the Nairobi slums of Korogocho and Viwandani. The study will also explore factors that influence these practices such as cost of healthcare, accessibility of facilities and quality of care. Other study cities include Ibadan, Nigeria; Karachi, Pakistan, and Dhaka, Bangladesh. Evidence from these diverse sites will improve understanding of what it takes to achieve effective and efficient delivery of healthcare for the urban poor. One of the study activities is a mapping exercise to identify where healthcare facilities are located in Korogocho and Viwandani, to support further analysis on accessibility and costs. The first phase of this mapping was conducted in a mapathon held at the APHRC campus in January 2018. 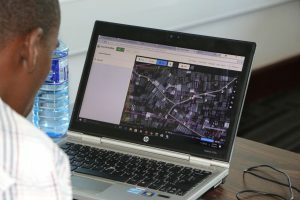 The mapathon involved university students, professional mappers, representatives from Korogocho and Viwandani as well as staff from the center. Their mapping skills ranged from novice to master-cartographer. These ‘citizen mappers’ used satellite images, existing maps and geographic information systems (GIS) software to add missing features and modify existing ones so that the maps are a more accurate representation of reality. Specific features that they were identifying included roads, health facilities, water sources and sanitation points in the two slum areas. Participation by community members at the event was critical, because of their intimate familiarity with the areas being mapped. 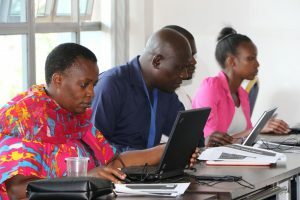 It also provided an opportunity for empowerment, as the skills they learned during the mapathon can be adapted and used for other community-building activities. The mapathon was just the first step in understanding patterns of health service delivery within the two Nairobi slums; the resultant maps will feed into the long-term project goal to develop viable models for delivery of health services in slums worldwide. While slums will continue to be part of our urban reality, poor healthcare service provision in these areas should not. The research w as commissioned by the National Institute of Health Research using Official Development Assistance (ODA) funding. The views expressed are those of the author(s) and not necessarily those of the NHS, the NIHR or the Department of Health and Social Care. This entry was posted in APHRC, Uncategorized and tagged Access to Healthcare, APHRC, digitisation, healthcare, HOT, Kenya, Korogocho, mapathon, Nairobi, NIHR, OpenStreetMap, Satellite imagery, Slum, Slummapping, Tasking Manager, Viwandani, Warwick, WarwickUni. Bookmark the permalink.